Heading into Week 6, Dallas Cowboys quarterback Dak Prescott needed to throw eight passes without getting picked off in order to break Tom Brady‘s record for the most consecutive passes thrown without an interception to start a career. Late in the first quarter, Prescott completed a pass to Terrance Williams on the left sideline to do just that. It was his 163rd straight pass without an interception to start his career. He started the game 7 of 8 for 79 yards and a touchdown to Cole Beasley near the goal line. The record-breaking completion to Williams was of the kind we have seen from Prescott quite often this season. He climbed into the pocket set for him by the Cowboys’ offensive line, scanned the field and came back to a receiver coming across the field to the back side. Later in the drive, it appeared that Prescott had been intercepted for the first time in his career as Julius Peppers hit him from behind as he attempted to throw, but the play was ruled a fumble. 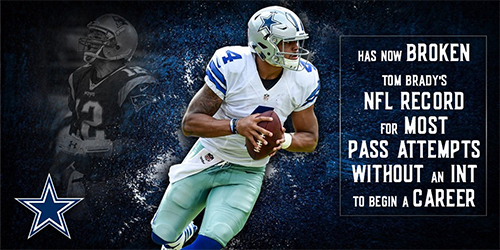 So Prescott’s record streak is still going, with 164 consecutive interception-less passes and counting.